60% of Democratic voters said the same, for a gain of 9 points in the same period. Share of GOP voters backing this stance grew 11 points to 49%. 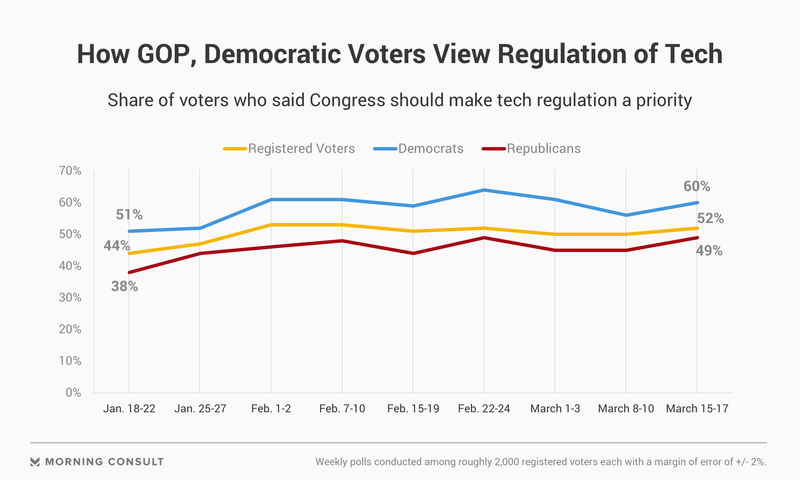 As Sen. Elizabeth Warren of Massachusetts and other Democratic presidential hopefuls unveil platforms that include new restrictions on big technology companies, the latest Morning Consult/Politico poll finds a majority of voters want Congress to prioritize tech regulation. The share of Democratic voters who said the same rose 9 points over this period to 60 percent, while the share of GOP voters grew 11 points to 49 percent. 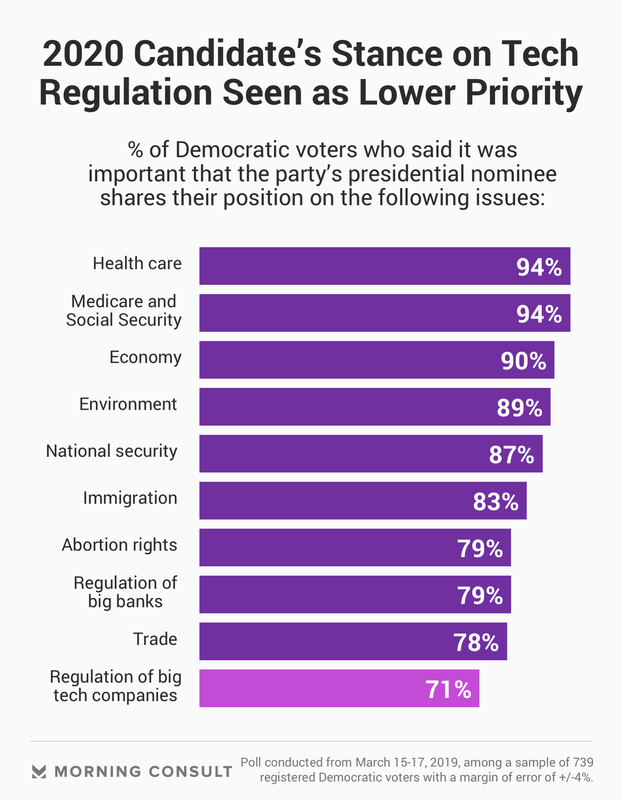 However, tech regulation was low on the list of voter priorities in the survey, with health care reform and reducing the federal budget deficit coming out on top. Still, tech regulation edged out issues such as possible impeachment proceedings against President Donald Trump and constructing a wall on the U.S.-Mexico border. As regulation of large tech companies takes center stage for several 2020 Democratic candidates, experts say the bipartisan interest in regulating tech foreshadows a broader focus on overall antitrust regulations to come in the election cycle. Among Democratic voters, 71 percent said it was important that the party’s 2020 presidential nominee shared their stance on tech regulation, but that issue was less important to them than the candidate’s positions on health care and senior issues. Dipayan Ghosh, who served as a technology and economic policy adviser in President Barack Obama’s administration and is currently the Shorenstein Fellow at Harvard Kennedy School, said motivating factors for targeting this industry vary by party, with Democrats pushing for tech regulation in part because of Russian interference on social media platforms in the 2016 elections, and Republicans being influenced somewhat by the perception that tech platforms censor conservative voices. “It’s really politics driving both sides to the same point, which is that we need better privacy and competition standards on this industry,” Gosh said. Warren is not the only Democratic candidate who has made technology a pivotal part of her campaign: Sen. Amy Klobuchar (D-Minn.) called for more tech regulation during her kick-off announcement, while Sen. Bernie Sanders (I-Vt.) continues to take on Amazon.com Inc.’s wages and alleged tax avoidance. Shomik Dutta, a partner at Higher Ground Labs who worked on both of Obama’s presidential campaigns and several Democratic campaigns, said the call to regulate tech companies fits a greater trend from the party to break up corporate entities. “In some ways, we are picking these fights across spectrums,” Dutta said, who also noted renewed pushes for “Medicare-for-All” legislation as a similar call. Rob Atkinson, president of the Information Technology and Innovation Foundation, a think tank whose board includes tech company executives, said he sees the idea of regulating the tech industry as a gateway to campaign around antitrust in other sectors, such as Wall Street and finance. Ghosh said chances are that the early campaign talks on tech will die down.